This Adult Bib is Crafted in the USA! 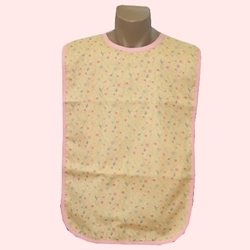 This is our adult bib with a floral pink and blue design. It features a full waterproof back barrier and measures 18" wide and 30" long. It has two snap neck closures to allow for neck size adjustment. It has a pink binding on the edge.